standards at the receiving water. Non-numeric Effluent Limits. The final MSGP contains updated non-numeric effluent limits to align with EPA’s final 2015 MSGP. The updated non-numeric effluent limits include requirements for minimizing exposure, good housekeeping, maintenance, spill prevention and response procedures, and employee training. The associated SWPPP documentation requirements have also been updated to reflect the changes in the permit and will document owner or operator compliance with the nonnumeric effluent limits. Changes to Sector S (Air Transportation) The final MSGP includes the Airport Deicing Effluent Guidelines promulgated by EPA in 2012 (40 CFR Part 449) and EPA’s final 2015 MSGP for this sector. These updated conditions in the final MSGP include numeric effluent limits and monitoring, reporting and recordkeeping requirements outlined in 40 CFR 449.20. Semi-Annual Monitoring and Discharge Monitoring Reports (DMRs) The final MSGP increases the frequency for Benchmark and Numeric Effluent Limit monitoring and reporting from once per year to twice per year. With these changes, a separate submission of a Corrective Action Form will no longer be necessary to report results of follow-up benchmark monitoring as the semi-annual DMR data will allow the Department to track the effectiveness of any corrective actions. If there is an exceedance reported on a semi-annual DMR, the subsequent semi-annual DMR will show if the pollutant of concern has been abated to levels that are below the specified permit numeric effluent limits or benchmarks. In addition, the final MSGP requires that the Annual Certification Report (ACR) be submitted by January 28 of each year. The ACR includes a description of the exceedance, corrective measures and long-term preventative actions taken. Electronic reporting The final MSGP requires electronic reporting of DMRs through EPA’s electronic reporting system, NetDMR. This change is required by EPA’s E-reporting rule (Federal Register, Vol. 80, No. 204 (October 22, 2015)). The final MSGP allows the use of electronic filing of the Notice of Intent (NOI) and the Annual Certification Report (ACR). Paper submission of these reports (other than DMRs) will continue to be an option until December 21, 2020 when that portion of EPA’s E-reporting rule becomes effective in the final MSGP. Removal of Sectors AD and AE from the Permit The final MSGP removes Sectors AD and AE. These sectors were included in GP-0- 12-001 and reserved for industrial facilities whose activities were not specifically listed in 40 CFR 122.26 but where the Department determined it appropriate for permit coverage due to site-specific circumstances. Removal of Sectors AD and AE from the final MSGP will require those facilities designated by the Department as needing permit coverage to obtain an individual permit, where appropriate. No Exposure of Copper The final MSGP adds a non-numeric effluent limit for no exposure of copper in Sectors A, F, G, N, and AC. The owner or operator of a facility subject to any of these sectors that discharges to a copper impaired waterbody shall implement BMPs to prevent the exposure of copper sources and copper containing materials or processes to stormwater. These materials need to be protected by a storm-resistant shelter to prevent exposure to rain, snow, snowmelt, and/or runoff. 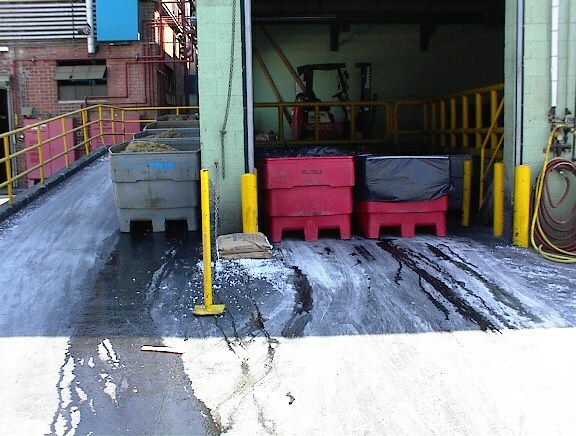 Mercury Spill Kits The final MSGP includes BMPs to stock and use mercury spill kits for Sector M – Automobile Salvage Yards and Sector N – Scrap Recycling and Waste Recycling Facilities. This addition is necessary for this sector where there is a mercury effluent limit in light of the Department’s updated policy on mercury (TOGS 1.3.10, revised October 2015). Good Housekeeping in Sector O The final MSGP adds Good housekeeping measures for Chemical Loading and Unloading Areas in Sector O to more closely align with EPA’s 2015 MSGP. Representative Outfall Waiver The final MSGP clarifies the corrective action process to align with the new semiannual monitoring requirements and ensure inclusion of representative outfalls. When corrective actions are triggered due to monitoring exceedances at an outfall, the representative outfall waiver is suspended at all outfalls that were covered by the waiver. These outfalls must then be monitored for all parameters. In order for the Representative Outfall Waiver to again apply, the owner/operator must submit a new Representative Outfall Waiver Form certifying that the results of two consecutive monitoring periods show that the outfall has no exceedances of benchmark monitoring cutoff concentrations. Alternative Certification of “Not Present” or “No exposure” waiver The Alternative Certification of “Not Present” or “No exposure” waiver for Benchmark monitoring on an outfall-by-outfall or pollutant-by-pollutant basis has been eliminated from the permit. Timing of Monitoring The final MSGP specifies that if a facility’s permit coverage is effective less than two months from the end of a monitoring period, monitoring begins with the next monitoring period. This has been increased from “less than one month” from the end of a monitoring period. Definition of “Qualified Person” The definition for qualified person has been added to clarify the qualifications for inspectors. A qualified person may be either a facility employee or hired consultant who is familiar with the day-to-day operations associated with their assigned responsibilities at the facility. The qualified person possesses the knowledge and skills to assess conditions, operations and activities at the facility that could impact stormwater quality and can evaluate the effectiveness of control measures being implemented as part of the requirements of the permit. The owner/operator may designate more than one individual as the qualified person. Additionally, if erosion and sediment controls are to be inspected the qualified inspector must be trained in Department-endorsed Erosion and Sediment control training.